Her claim of “an influx of almost one thousand different units” since June 1, 2015 caught my ears. By coincidence, the city staff completed a study for the Planning Commission on October 7 (same day as the forum) that summarized residential development activity since the modifications to the APFS on June 1, 2015. It turns out that Feinberg’s claims are either untrue or grossly exaggerated. It’s easy to substantiate this conclusion not only from the staff report but with the data provided on the City of Rockville’s web site. 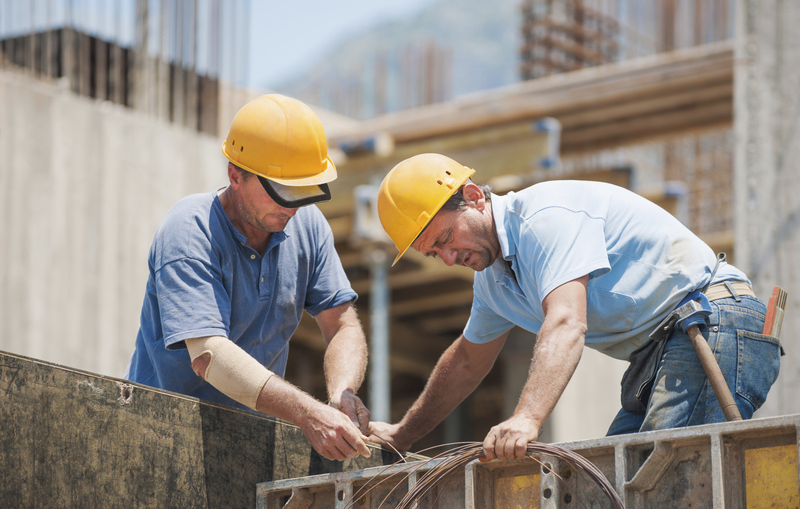 At any time, you can look up current and past development projects and see what’s happening. That totals 1,047 residential units that are currently awaiting approval from the Planning Commission, however, all of them started with a pre-application process that began months, even years, before June 1 with the same number of residential units and thus do not seem to affected by the revisions to the APFS. The only change that might have been prompted by the revised APFS is the EYA/Tower Oaks project, which increased from 365 to 375 units after June 1—a difference of 10. To cast a wider net, there are 393 units in the pre-application process but it’s unclear what the results will be after review by staff and the community, plus most of those units are exclusively for seniors and will have no impact on schools, thus shouldn’t be considered in this analysis. I also discovered that the JBG/Choke Cherry project on 5 Choke Cherry Road was previously approved for 293 residential units but its current application proposes eliminating all of them in favor of retail and that the Dewberry/Syms project at 1900 Chapman Avenue dropped from 339 units to 70. So while we can say that more than 1,000 residential units are currently being considered by the City, what we can’t say is that they’re a result of the changes to the APFS because all of those projects began with the same number of units before June 1. Nor can we say that development is happening without considering their impact on “roads and public transportation facilities, sewerage and water service, schools, and fire and emergency services protection”—that’s required for all development projects (I’m not sure why Ms. Feinberg would even claim that this is being overlooked; see 25.20.02 of the City Code). 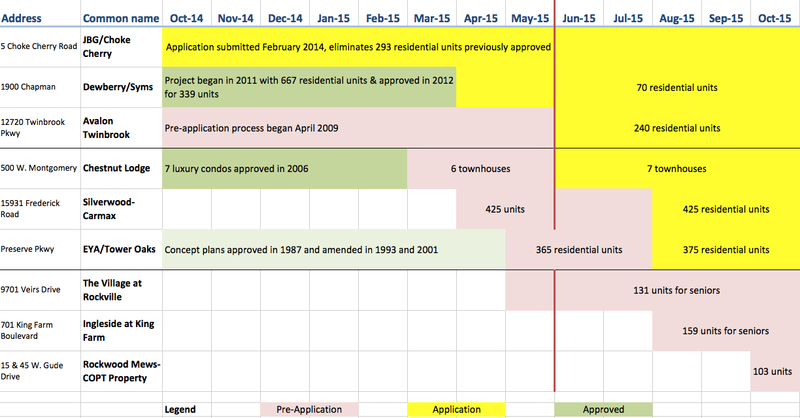 Here’s a chart to explain current residential applications graphically (yellow is a current application, pink is pre-application, and green is approved, and red vertical line represents June 1, 2015 when APFS changed). For a future analysis, it would be interesting to examine how the projects would have differed under the old and new APFS (would the number of residences been the same, higher, or lower?) or how this level of development in 2015 compares to previous years (did the dam burst or is the typical flow?). *I have unable to identify the project that Feinberg mentioned as “one area that has been along Wooton Parkway where 102 are proposed for the Rockshire community.” There are no projects in pre-application stage or in the application process with this address or number of units. Even if it were included in this analysis, it will not raise total to the level of “almost one thousand units” claimed by Feinberg. **The EYA project is for 375 units. Feinberg is referring to a concept for town houses at Rockshire Village Center, an almost empty commercial plaza. This location is in the Wootton cluster. This cluster, including Wootton High School, Frost Middle School, and Lakewood Elementary, is right around 100% capacity. Thus, this concept would have been within the old, tighter APFS limits. After the meeting at Lakewood elementary, the owners of Rockshire Village Center are taking the time to conduct studies requested by the communities. This includes a determination of the viability of commercial establishment and traffic studies. They have also acknowledged that they need to provide parking for the Rockshire Community Center. In any case, there is no connection between the APFS standard changes made in June and this concept. The Silverwood apartments (and the, apparently now nixed, Choke Cherry apartments) feed into the Gaithersburg cluster. Would we rather defer to Gaithersburg to follow through with development to take advantage of capacity in those schools (under Montgomery County standards)? Withholding Rockville development will ultimately have zero net effect on that cluster. It will only hurt Rockville’s tax base. Just sayin’.